Some Senators at the University of Saskatchewan in Saskatoon want the Chair of the Board of Governors to resign. She serves on the Board of the nuclear giant, Cameco. The senators also say lawyer Nancy Hopkins’s position as a board member for Cameco Corp. puts her in a conflict of interest chairing a search committee for a new university president. In a letter sent to the university’s secretary and board vice-chair earlier this year, environmental lawyer and senator Stefania Fortugno points to equity Hopkins has at stake that rides on Cameco’s performance. Fortugno questions whether Hopkins’s role is connected to the university’s increasing focus on nuclear research. “Any time that the University of Saskatchewan enlarges the role of the nuclear sciences on campus, through the appointment of faculty chairs, or establishing a new $30-million nuclear research centre and allocates scarce educational resources to the same, the share prices of Cameco Corporation correspondingly increase,” the letter says. Cameco is everywhere in Saskatoon; it’s frightening. I’m with the Senators on this one. P’n’P covered the NASCO Corridor/NAFTA Superhighway quite a while ago, back when all the powers-that-be were denying it was a plan in action. Well, Regina now has its ‘global transportation hub‘ and the signs on the highway aren’t worth stopping to photograph. But here’s an update to a previous P’n’P piece which revives the USA’s Superhighway problem in Texas. Perry’s campaign website lists the Trans-Texas Corridor as one of his accomplishments, “Rather than taking decades to expand these important corridors a little bit at a time, Governor Perry developed the Trans-Texas Corridor plan.” But is it something Perry really wants broadcast as an achievement? The Texas Republican Party’s 2010 platform includes a plank specifically opposing the Trans-Texas Corridor. Some of the opposition to the NAFTA Superhighway has been dismissed as conspiratorial, but loud objections also came from people concerned with border security and one million rural interests and farmers that stood to lose their land to eminent domain. It seems as though the editorial board of Regina’s daily newspaper can’t be bothered to so much as appear to provide balanced coverage of the uranium industry in Saskatchewan. In a meeting with the Leader-Post editorial board this week, NWMO president and CEO Ken Nash made the point that the safe storage of nuclear waste should be a legacy to the future generations that will inherit it and who might even have the technology to retrieve and recycle it 100 years from now. Besides the ridiculous spin Mr. Nash and the Leader Post place on the issue — that it’s our responsibility to pass the problem we’ve created on to the next generation because they might be able to fix it — they have not solicited the opinion of anyone else in reaching their decision. Interestingly, Saskatoon anti-nuclear activists and others indicate that the Leader Post‘s sister publication in Saskatoon, the Star Phoenix, has refused to meet with representatives of the anti-nuclear movement. Their editorial is misleading in that it slants toward support for storing nuclear waste in Saskatchewan for economic and xyz reasons, but ends with a call for more study. Before turning our back on another chance – particularly in a chronically underemployed region of the province – without testing out the risks and science behind it would be unconscionable. In their not-so-subtle propaganda, the editorial boards of two of Saskatchewan’s daily newspapers demonstrate blatant bias to the nuclear industry and choose to ignore the research already conducted, research that says that for social and technical reasons nuclear waste should not be stored underground. But, oh, they obviously enjoy the appearance that they’ve done their research otherwise, why issue such a fatherly statement? All this is to say that the public is being misinformed about a deadly substance, courtesy the mainstream media. please think about where you can join us. Talk to your friends and family to see if they’re interested to support this walk by walking/driving/providing food /water/transportation etc. For more details http://www.facebook.com/sayno2nuclear waste Things are evolving quickly so check it periodically. A point of clarification about the attached Itinerary: Some sections have groups walking simultaneously. See the 4th column called Section / Km for these details. For example, July 27th 4-27 = 4 groups with staggered starting places along the route, each walking 27 Km. 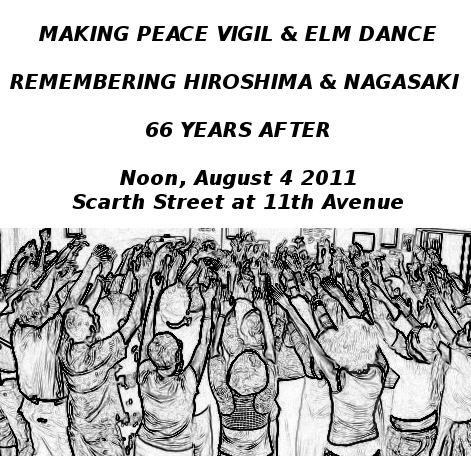 Regina’s Making Peace Vigil and the Saskatchewan Singers of the Sacred Web invite you to join in the Elm Dance on Thursday, August 4 at noon on Scarth Street at 11th Avenue. From its Latvian roots this intimate folk song has grown into the Elm Dance and is danced by circles of activists around the world, from Novozybkov, 100 miles downwind from Chernobyl, to the uranium mines of northern Saskatchewan. On this anniversary of the bombing of Hiroshima we dedicate this dance to all places and beings damaged by uranium mining, nuclear weapons, and nuclear power generation, including most recently Fukushima, Japan.